In the wild, hedgehogs are primarily insectivores, but they will often eat whatever is available. 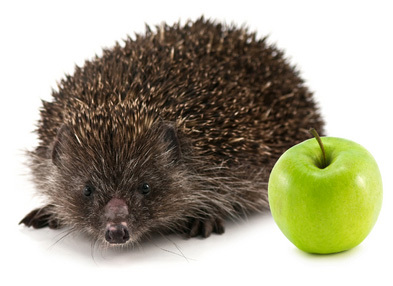 Hedgehogs have been known to eat insects, slugs, baby mice, frogs, fish, worms, small snakes, eggs, and even fruit. They are definitely not picky eaters. For your pet hedgehog you want to provide a well balanced diet that is high in protein. How much you should feed him depends on his activity and metabolism. If you notice your hedgehog becoming fat, cut back on his portions. A nutritious diet will help ensure you have a happy and healthy companion for many years. Below is a list of some of the items you could feed your pet. There is commercial hedgehog food, but it is not always available at some pet stores. A meat or chicken dry cat food that is high in protein is a decent alternative. Dry food should be the primary portion of your pet’s diet. Moist food should also be fed to your pet. Canned cat or dog food work well as hedgehog food. Be sure to get a food that is high in protein and is made primarily from meat or chicken. A small amount of fruits and vegetables should be added to his diet. Some foods you could use are beans, peas, corn, apples, and carrots. Your pet may only like a few types of fruits or vegetables so try a variety. These foods should only be a small portion of the diet so don’t overfeed him fruits and vegetables. Everybody loves junk food and your hedgehog is no exception. Treats are a great way to add variety to his diet, but should be fed in moderation. Insects like crickets and mealworms make great treats. Other choices are moist cat or dog treats, and cooked foods like eggs, hamburger, and chicken. Giving him a small piece of your food is an easy way to supply treats. A hedgehog needs to always have a source of clean fresh water. A stoppered water bottle in his cage is the best way to supply water.